Pan-Seared Chicken With Herbs De Provence! 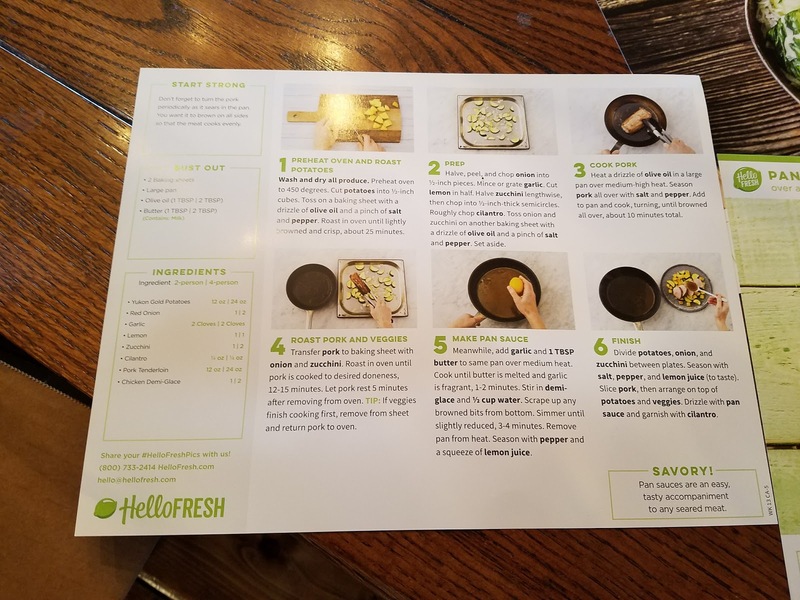 I made the second dinner from Hello Fresh on Wednesday night. I decided to make this particular one because it had the grape tomatoes in it and I wanted them to be super fresh. Everything all laid out and ready to go. 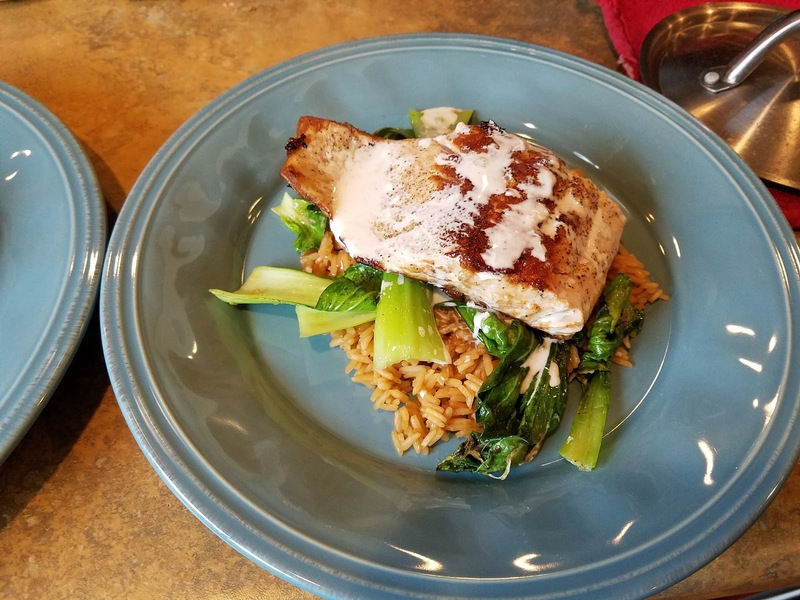 There were a couple things I had never worked with before....farro and a scallion. I've made plenty of recipes that call for a scallion, but I've always just used an onion instead. It really isn't that much different it's just more mild. 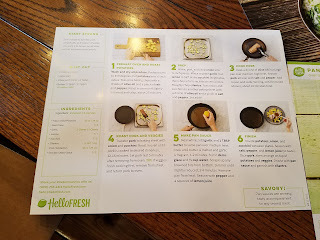 I thought I'd actually take a picture of the recipe card this time. As I waited for the water to boil to put the Farro in a diced up the scallion and then cut the grape tomatoes in half. The chicken needed to be butterflied and then seasoned with Herbs De Provence. The butterflying part isn't hard it's just that I don't really have very nice knives so it wasn't super pretty. New knives are on my list. In fact I just bought 2 Chef's knives and 4 new Paring knives today. Maybe a new filet knife will be the next one on my list. 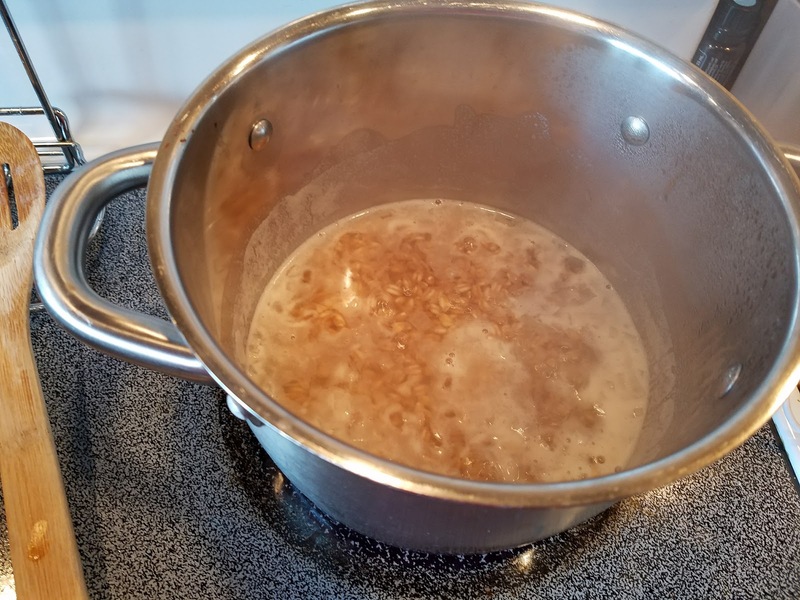 After the water came to a boil I added the Farro and the diced up scallion. I also made up a dressing with a little bit of balsamic vinegar, honey and olive oil. 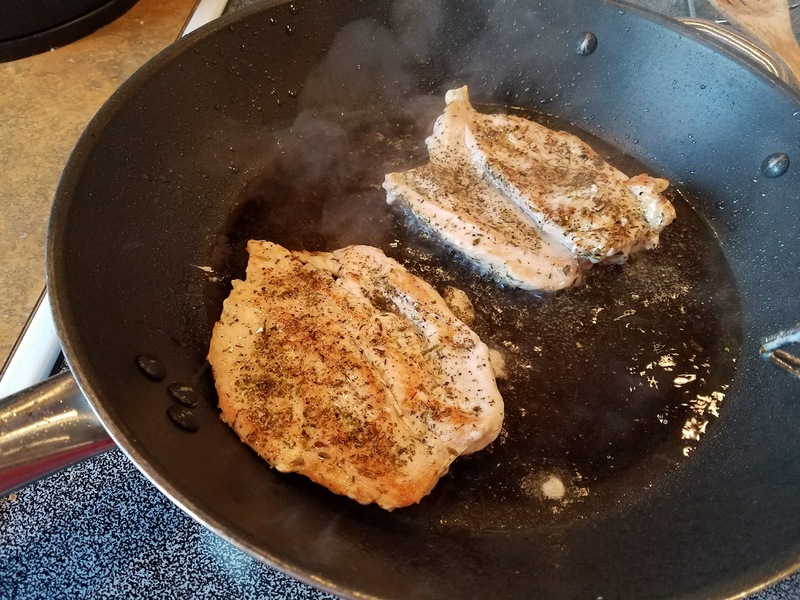 I pan-seared the chicken in a little oil. 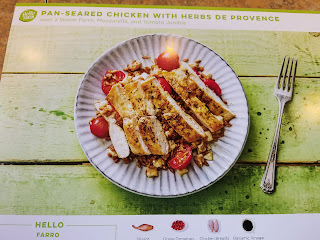 I think I mentioned this before, but my main reason for wanting to try this meal was because of the Herbs De Provence. I've always wanted to try it. It has lavender in it so it smells great! 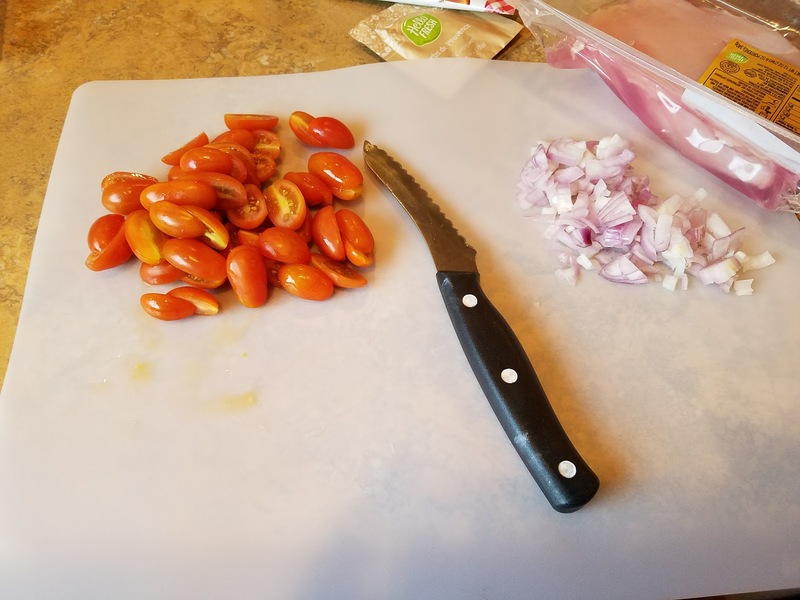 After the Farro was finished cooking I added in half of the dressing, the tomatoes and the fresh mozzarella I had cut up into cubes earlier. To plate it I put half the Farro mixture on the plate and then sliced up the chicken and placed it on top and drizzled it with the rest of the dressing. Oh my goodness! This was so yummy! The Farro was great!!! 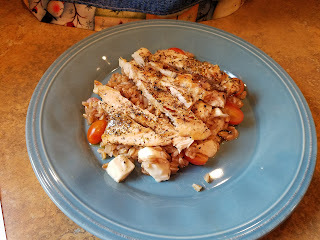 I loved the nutty flavor it had and the Herbs De Provence was flavorful without being too much! It was also really filling...I even had some leftover! The best thing about this meal was I made it on the day that I spent 7 hours shopping/putting away all the groceries for April. Normally on shopping day I'm so spent that I end up not cooking anything special. It was so nice to have this on hand and ready to go. I did have to cook the kids dinner, but that involved putting Bagel Bites on a cookie sheet....don't judge! 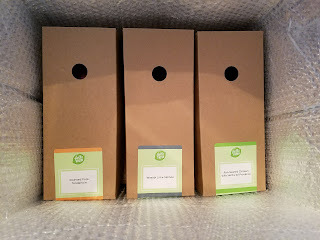 I told Michael that I think it really would be worth it to order once a month and have them always deliver during that last week of the month. By then I'm usually out of something that I needed for a recipe because it was used to make a different recipe during the month. I'm also just tired! 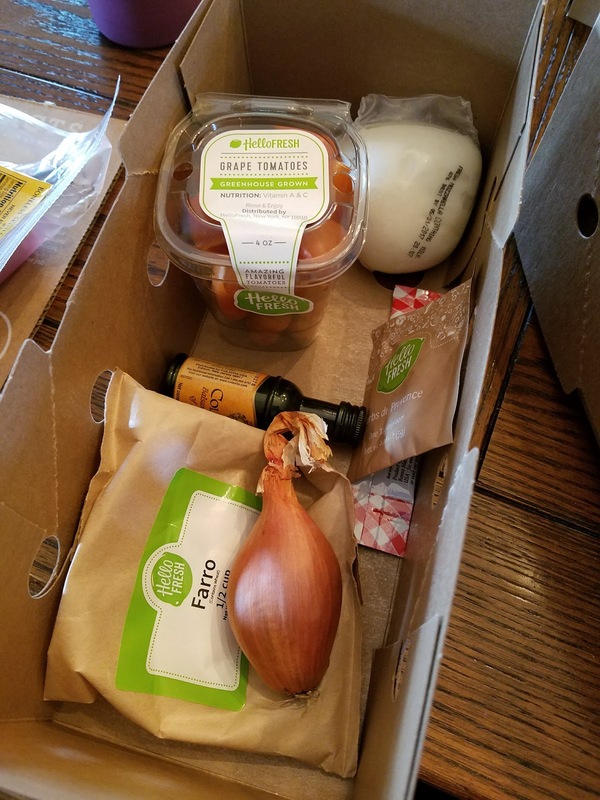 This is also such a great way to get introduced to new recipes and not have to stress about buying a ton of ingredients and then end up not liking it. Now that I know we like the flavor of Herbs De Provence I'll go out and buy some to have on hand! I'm also going to buy some Farro as well. It's so nice to have other ideas for side dishes!!! Two meals down...one to go! Back when Michael first started working at the Water District I wasn't sure I was going to like his pay schedule. We went from receiving weekly unemployment checks to being paid once a month. Of course I was very, VERY grateful for those once a month paychecks and so, SO happy that Michael was working and didn't have to receive unemployment. I just knew it would be a big adjustment for me in regards to our budget. I can't remember exactly when I started shopping monthly, but it's been quite awhile now. It's definitely taken some trial and error to get it right and I still have off months where I keep having to run back to the store because I forgot one thing we needed that was crucial to a particular recipe. Those months are the worst! I hate going to the store over and over again. 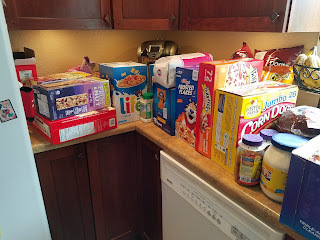 I do feel like I've gotten to a really good place in regards to our monthly shopping. I feel like I'm in a good groove and I rarely forget to buy something that we need. I might actually buy something two months in a row by accident....hello giant bottle of teriyaki sauce from Costco! I thought it might be nice for me to document this particular time in our lives prior to having any teenagers in the house. It hurts thinking about what the grocery bills are going to be when we get to that milestone! Ouch! Typically it takes 5 hours for me to get all our grocery shopping done for the month. Then another 1.5 hours to put everything away when I get home. 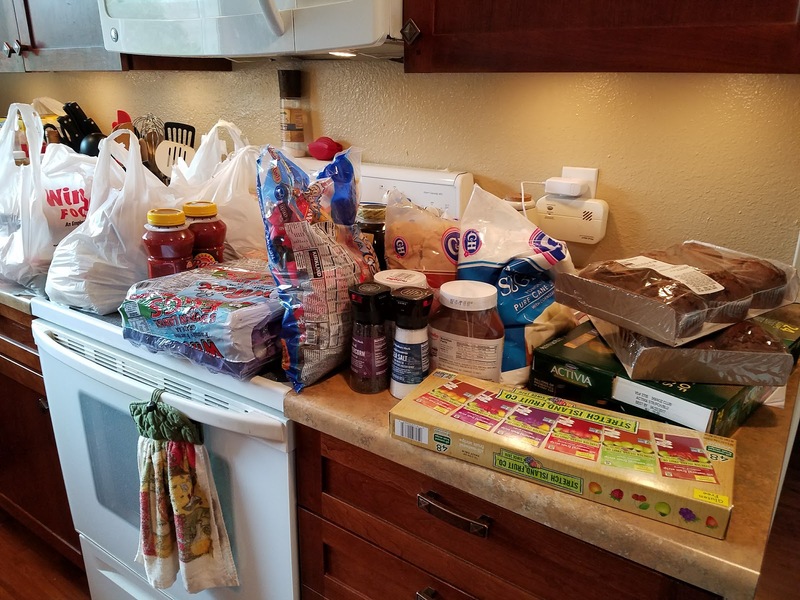 Here is the timeline for our most recent shopping trip. 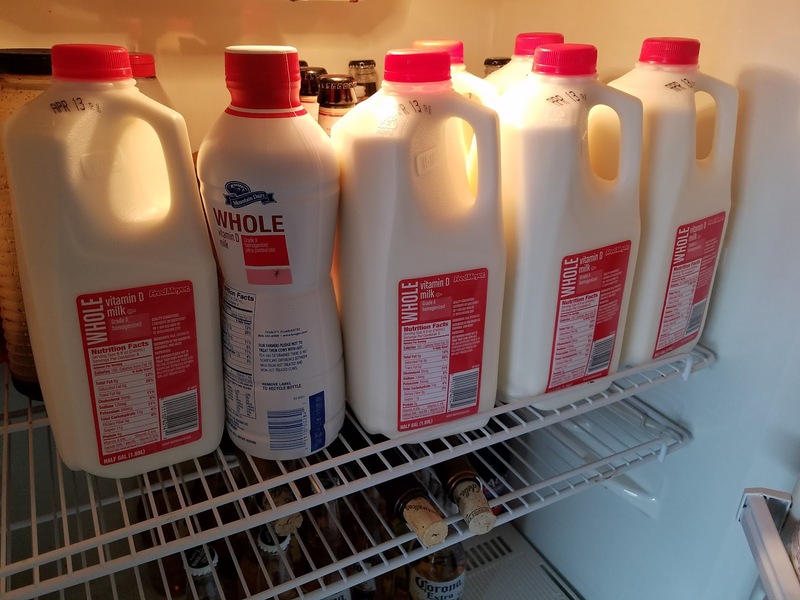 I'm particular when it comes to milk and bread. I just love Fred Meyer's so that's what I stick with. On this particular trip I also got all the stuff on Zeke's WIC checks. Only two more months and he's finished with WIC. 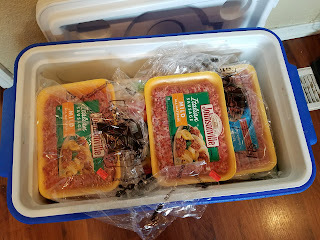 I love to stock up on english muffins and bagels...they freeze great. This time I also found some hamburger buns and Texas Toast to make french toast with. 8:20 - Go home, unpack food and put the refrigerated stuff away. Pack up a cooler for the cold stuff purchased at Winco. The reason it makes sense for me to stop at our house is because Fred Meyer's and Franz are all north of our house and all the other stores are south of our house. I have to pass right by it anyways. I hate to backtrack so if this didn't work out that way there is no way I would be stopping and unpacking food! I love Winco!!! I love the bulk section....it's just the best! I get all my pasta, spices, grains and candy for the kids from the bulk section. I also get the things I need to make a recipe come together...like a can of soup or some sauce mix. I do buy some cereal that they don't sell at Costco here as well. I try to stay under $60, but on this particular trip I spent over $80, but we are hosting Easter at our house this year. As for the cooler I packed at the house I use it to store all the cold stuff I get at Winco....yay for no more melted Popsicle! Costco is where I spend the big bucks! The trip usually costs around $300, but that includes more that just food. I set aside anywhere from $60 - $80 a month for toiletries and usually at least $40 gets spent at Costco. On this particular day I bought Glucosamine and vitamins for the kids. After buying all our groceries Zeke and I go over to the food court and share a piece of pepperoni pizza and a soda. My mom got me a membership to Sam's Club for my birthday last year. I don't usually spend more than $50, but it's nice that she doesn't have to buy things for me anymore and have me pay her back. 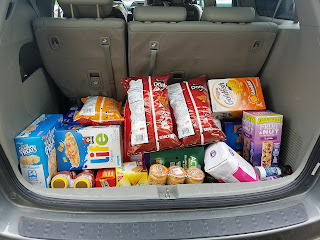 Sam's Club has a great chip selection and we are chipaholics at this house....not so much me, but the other 5 people can definitely munch through a few bags a month. This is where I get most of our toiletries that we don't buy in bulk...toothpaste for the kids, razors for me, shampoo, dental floss...you name it it's cheaper at Wal-Mart. I also LOVE the pepperoni from the deli so I buy it when I'm going to make homemade pizza. I also love that this is the last stop because I can buy most anything that I might have forgotten at any of the other stores and I don't feel like I've gotten a horrible price for it. 12:30 - Time to head home!!! 5 hours of shopping finished!!! And yes Zeke is with me the whole time. He's an amazing shopping buddy! 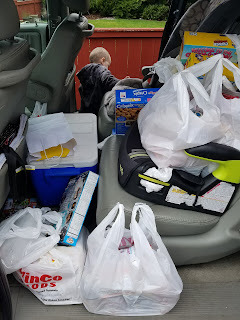 So this is what my van looks like after all that shopping! This is everything from Winco. 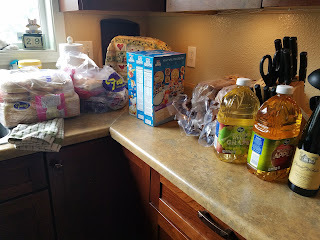 This is everything from Costco and Sam's Club. My trunk has a well so there really is a lot of food there it just doesn't look like it. 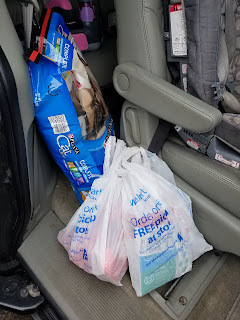 The cat food is from Sam's Club, but the bags are from Wal-Mart. I had already unpacked the stuff I bought at Fred Meyer's and the Franz Bakery Outlet. 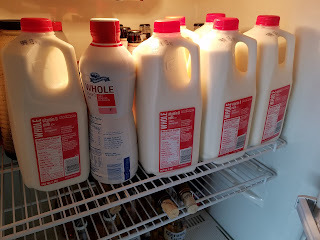 Here's all the milk from Fred Meyer's....I love having an extra frig in the garage! On this particular day Zeke was an amazing helper ...he helped me bring in groceries the whole time. He finally did get tired, but it was right when I was bringing in the last box from Costco. It takes well over an hour to organize and put away everything. I use a lot of reusable containers so I have to empty out the cereal, pasta, rice and sugar into those. Also just going through the freezer, pantry and cabinets to make everything fit can be quite a task. 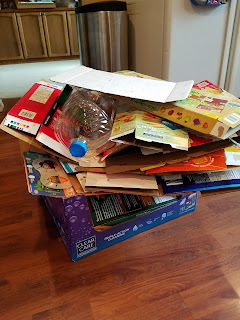 After all that organizing I usually have a giant stack of boxes for the recycle! On this day I completely finished at 2:30....just enough time for me to built Zeke a wooden train track before heading to the bus stop to pick up the big kids. Now don't think that I don't ever step foot into a store again during the month. I do usually have to make at least one more trip to Fred Meyer's in order to buy more milk, bread and fresh fruits and veggies. Overall though I feel like it pays off to shove everything into one day and get it over with. It does take planning and preparation, but it's absolutely worth it! As for money right now our monthly food budget for 6 people is $500 a month. 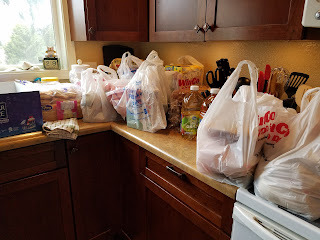 This month I spent $15 at Fred Meyer's - $10 at Franz Bakery - $80 at Winco - $300 in food at Costco - $45 at Sam's Club - Nothing at Wal-Mart for food. That's a totally of $450 so I have $50 left to purchase the milk, bread, fruit and veggies we'll need throughout the month. I also spent $60 dollars from the toiletries and another $20 from our miscellaneous budget for the cat food! It will be fun to look back on this in a few years...I'm sure my food budget will have gone up a bit by then! 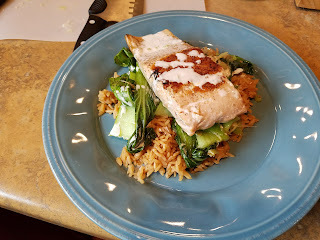 The first dinner I made from Hello Fresh was the Wasabi Lime Salmon. 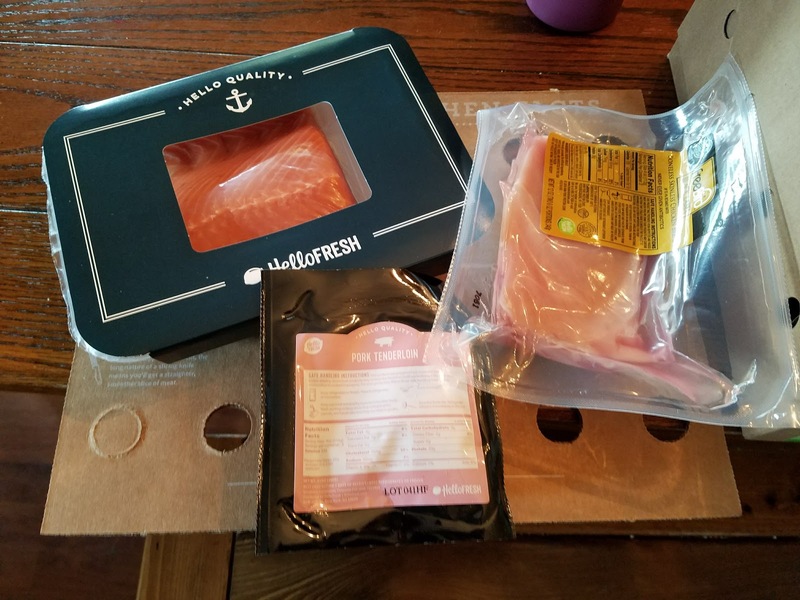 I got my box that had all the ingredients in it, my recipe card and the salmon. First thing I had to do was make the rice. 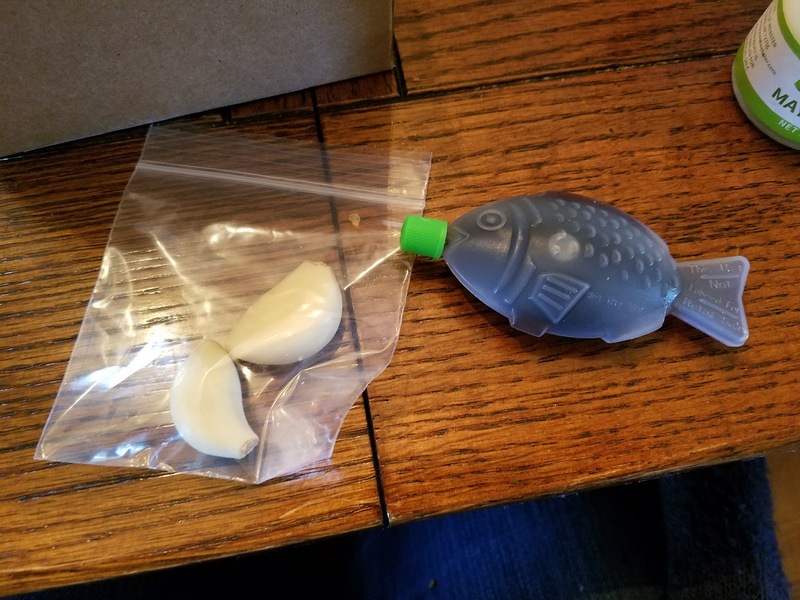 I measured out the soy sauce that was in the cute little plastic fish and it was exactly 1 tbsp which is exactly what I needed. 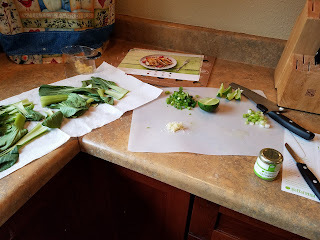 Then I rinsed the baby bok choy, sliced the scallions, cut the lime, grated the ginger and then grated the garlic. After this picture I mixed up the dressing which was that cute little jar of mayo, a little bit of garlic and ginger, wasabi paste, lime juice and a little water to thin it all out. After that I started cooking and it all came together so fast I didn't take any pictures. I was amazed at how it looked exactly like the picture on the front of the recipe card. How often does that happen! I layered ours just like they told me to on the recipe card. 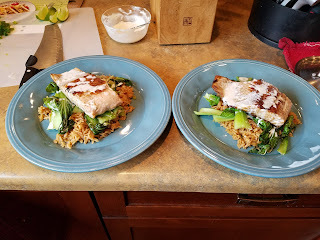 Rice, baby bok choy, salmon, drizzle the dressing over that and then squeeze some more fresh lime. Once I started eating I decided that the dressing was AMAZING and I drizzled a ton more all over my food. 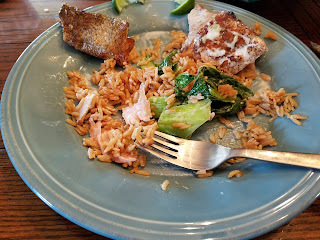 This meal was so fabulously good! Michael even licked his plate....shhh!!! As for difficulty I wouldn't say this was a difficult at all. The only thing I hadn't ever done before was grate fresh ginger, but I've grated garlic so it was just like that. No biggie! I've never cooked with bok choy or wasabi before, but now that I have I'm going to be more willing to make recipes that include them. They were both great and had great flavor. I will say I did not add all the wasabi that they gave me and they did advice not putting it all in, but just a little bit at a time. 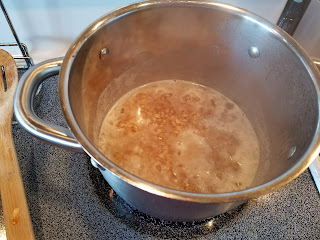 I was surprised with how much I did add, but it just added flavor and no heat. One meal down and two to go! About a week ago I was reading a blog and heard about Hello Fresh. I had never heard of them before, but the whole concept intrigued me. 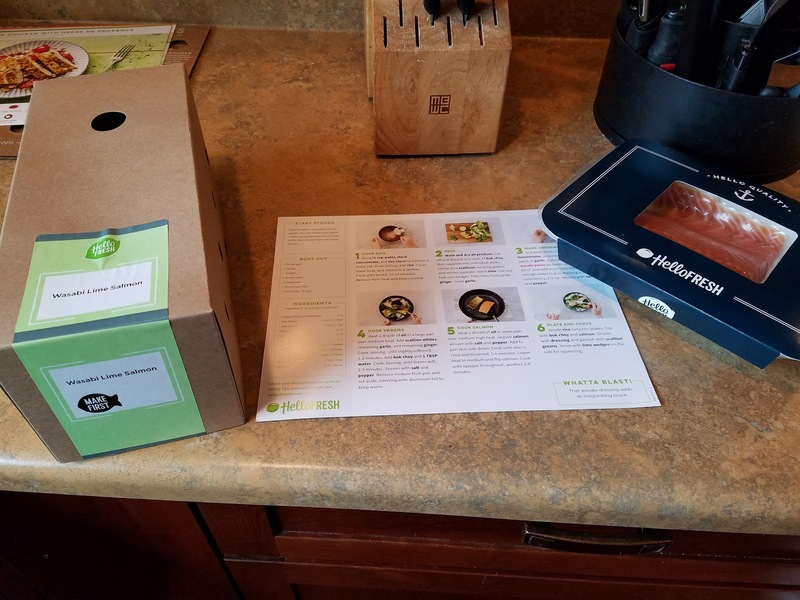 You get to choose meals, fresh food is delivered to your door and you get to cook it. Plus the best part was she had a code for me to use that got me $40 off my first order. I looked into it and that meant I would pay $20 for 3 meals. I figured it was worth a go! I was able to select the 3 meals from the 7 they featured that week. I wanted to pick the steak dinner, but that was considered a premium meal so that would have been a little extra. I didn't want to spend more than $20 though. You get to select what day of the week you'd like your meals delivered. 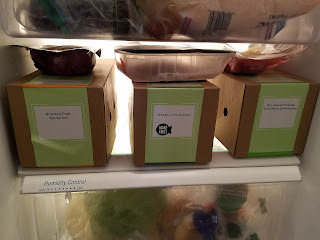 I chose today (Monday) since I knew I was going to be gone this last weekend and it would be awesome to have meals ready to go without me having to put much thought into it. Around noon I heard a knock at the door so I went to the door and there was this lovely looking box. I was so excited to open it! 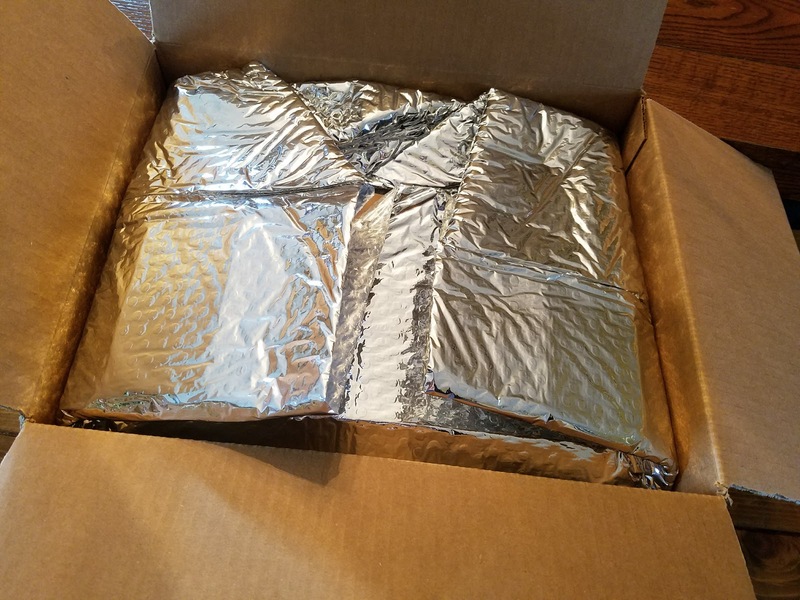 There was some fun looking insulated material inside the box to keep it all cool. 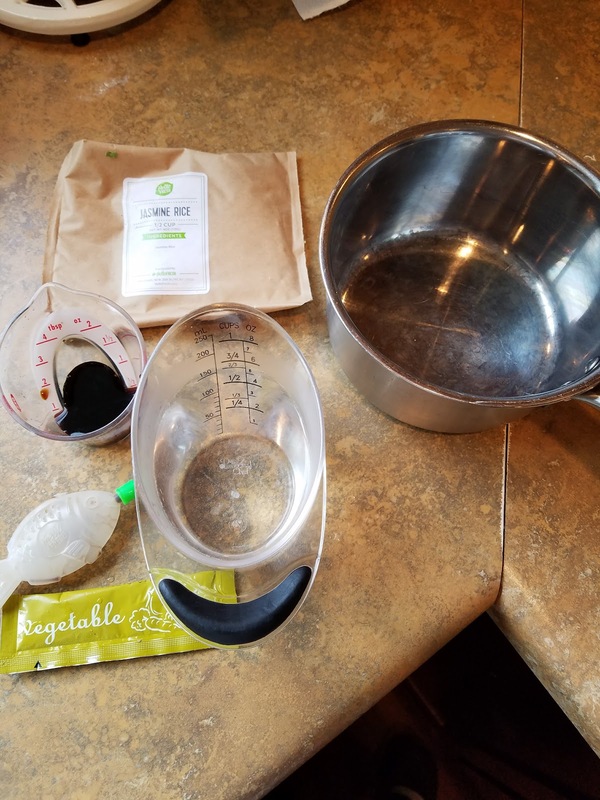 The next thing I pulled out were the 3 recipe cards. When I say cards it's not like a Hallmark Card...these are like cookbook sized sturdy cards. 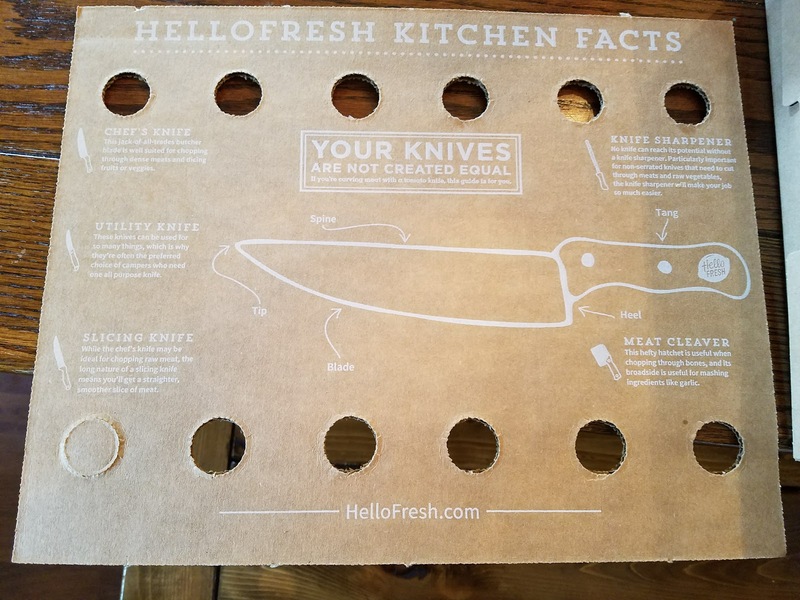 The back of the card has all the step by step instructions with pictures. There is also an area on the side that lists out all the kitchen supplies you will need like a large bowl, wisk, aluminum foil...etc. Under the cards were the three meals all organized in there own box!!! 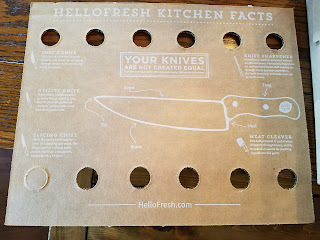 There was also this interesting cardboard cut out that had some facts about kitchen knives. After I took out the 3 meal boxes there were these bad boys!!! 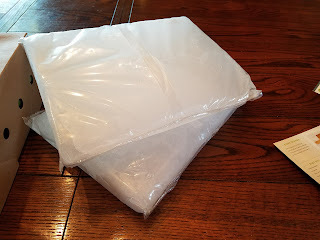 Two giant blocks of ice!! I loved this! I'm a homemaker, but a lot of people work. There is no chance your food would go bad with these in that nice insulated box. And you better believe I stuck those in my freezer because I just know they will come in handy down the road. Under the giant blocks of ice was the meat for our meals. At first I was thinking my goodness that is pretty small, but then I remembered they are only meant to serve 2 people. I decided not to get family meals because honestly the kids probably wouldn't touch civilized food with a 10 foot pole. I'm just going to make them something easy on the nights Michael and I get to enjoy this yumminess! The first box I opened was for the Wasabi Lime Salmon. 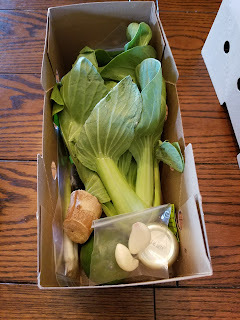 I've never eaten Bok Choy before....that I know of that is. I've most definitely never cooked with it before. I tried to pick recipes that took me a little out of my comfort zone. I like to be stretched when it comes to cooking and I felt like this was a pretty safe way to do it. 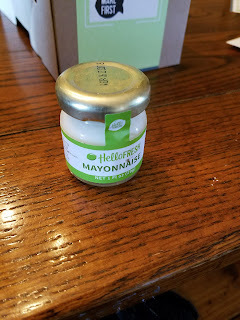 Everything except the kitchen tools is included....even this cute little thing of mayonnaise! 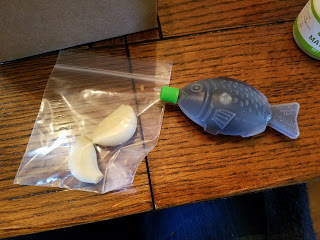 The garlic cloves were already peeled and this little fish holds the soy sauce! So cute!!! 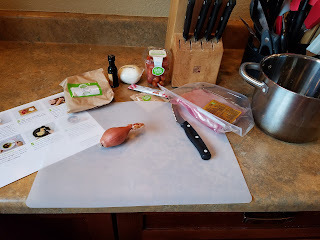 The next box was for Pan-Seared Chicken with Herbs De Provence. I chose this one because of the herbs. I remember watching the food network and hearing about this spice, but I have never tried it. Also the recipe has Farro and I've never tried that before either. It will be fun to give it a go! The last box was for Roasted Pork Tenderloin. This is not outside my comfort zone at all. This is probably something I would try if I saw the recipe online, but it looked really yummy...especially the citrus roasted potatoes. Here are the cute boxes all lined up in my frig. I was planning on cooking the salmon first because of the bok choy....I didn't imagine that would stay fresh super long. Then when I put them in the frig I noticed that black fish....it says on it...Make First! Love it! 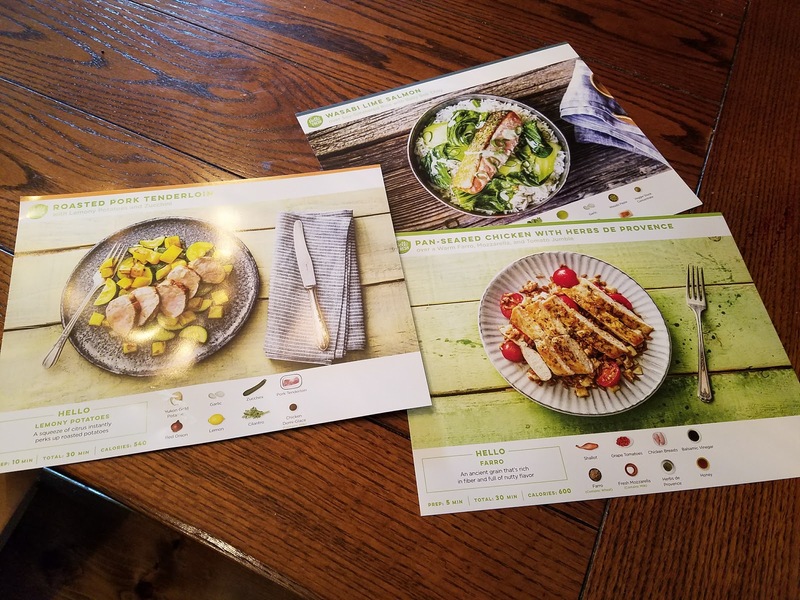 One of the things that I really like about this is now I have the recipe cards. If we do really enjoy some of these I can just add them into our normal meals. It's also really easy to pause your shipment if you want to skip a week. That's what I've done for next week. I only had to pay $20 this week, but now the normal weekly price will be $60. That's a bit much for us. I just mainly wanted to try it out. 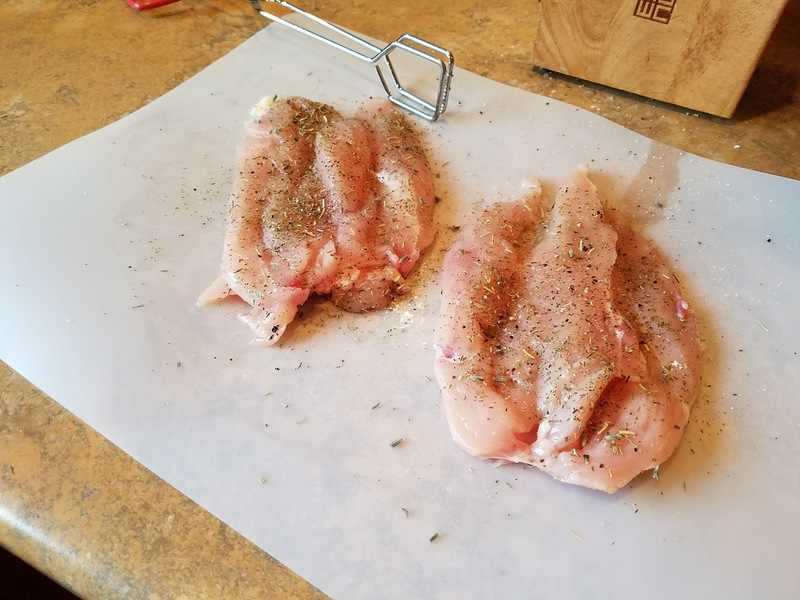 I will post an update after I actually cook it and eat it to tell you what I think about it! They did give me a coupon code to pass on. 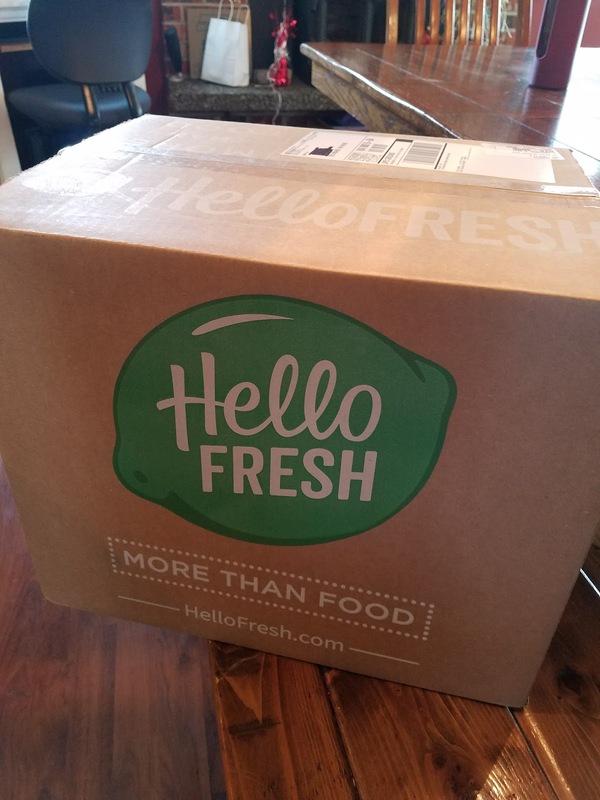 So if you are interested in saving $40 and getting 3 really nice meals for only $20 just click on this link....Hello Fresh. 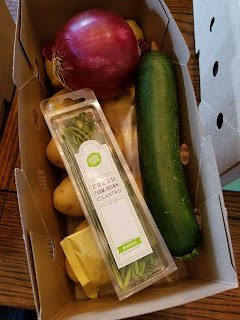 Just to be clear Hello Fresh did not pay me for writing this post...they only provided me with the code. I just like to share cool stuff! 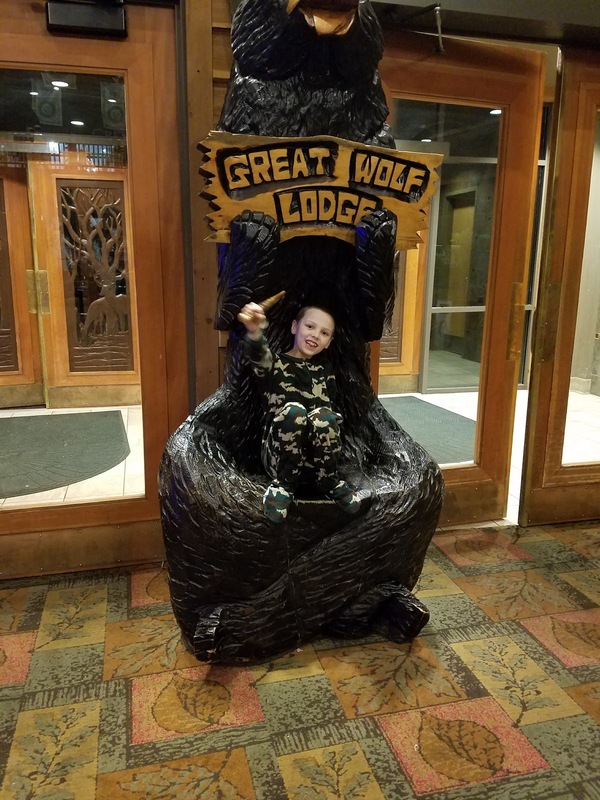 At the end of January / beginning of February my friend Melinda from MOPS mentioned that her home school co-op was going to Great Wolf Lodge and they were getting a really good discount. I have been wanting to take the kids to Great Wolf Lodge for years, but I really didn't want to take little little kids. Now that they are older I feel more comfortable about taking on this adventure. I didn't want to reserve it without talking to Michael first though. I thought that Melinda had said the room would be $189 and Michael seemed interested in going when I told him that price. Then I found out that the room was actually only going to be $139!!! I knew he would be all for it then, but again I wanted to wait until he got home to reserve it. Later that night after talking with him and confirming that it was something we were going to do I went online to reserve a room and they were booked! I was so sad!!! I texted Melinda and she said that she'd contact the lady from her co-op that set up the deal with GWL and see if they could add more rooms. Thankfully the next morning I got a text that it was a go and I could go online and reserve a room. We ended up getting a standard room with 2 queen beds and a pull out couch....with taxes it came to a $185!!! So cheap! Since we were going with the co-op that meant that we were limited to that specific day. It ended up being Sunday the 19th - Monday the 20th of February. I was really shocked that they ended up giving out this deal especially since it was Presidents Day weekend. The awesome part about that was the the kids were out of school and Michael was off work! Yay for not having to take vacation time! Since this was the day after Ella's tea party it was a crazy busy weekend. Thankfully since Ella's party was so early in the day that that left the afternoon and evening for me to pick up from the party and start preparing food for our trip. The next morning Michael did take the kids to church....he had to usher and then I stayed home to finish getting everything ready. After church they came and picked me up and after a bathroom break and a snack we were on the road. 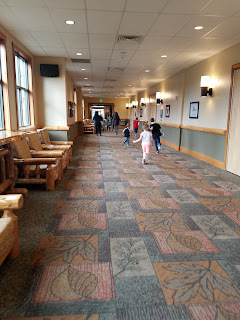 The weather was horrible that day....pouring down rain...perfect for spending time at an indoor water park! It was SO rainy though I ended up missing our exit and had to drive an extra 13 minutes in order to get to GWL. It worked out perfectly though because that extra time made it so the kids could finish the movie they were watching. Our first stop was at a restaurant that's in the parking lot of GWL. It's called Burger Claim! It was good food and not expensive. We got the kids each their own food and Michael and I got food as well and it was $38. Not bad for 6 people really! 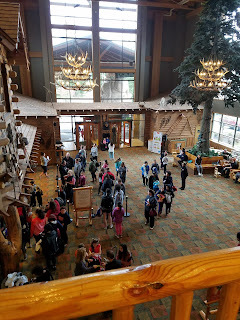 After eating we went over to the Lodge and got checked in. I had requested that our room not be next to the elevator. 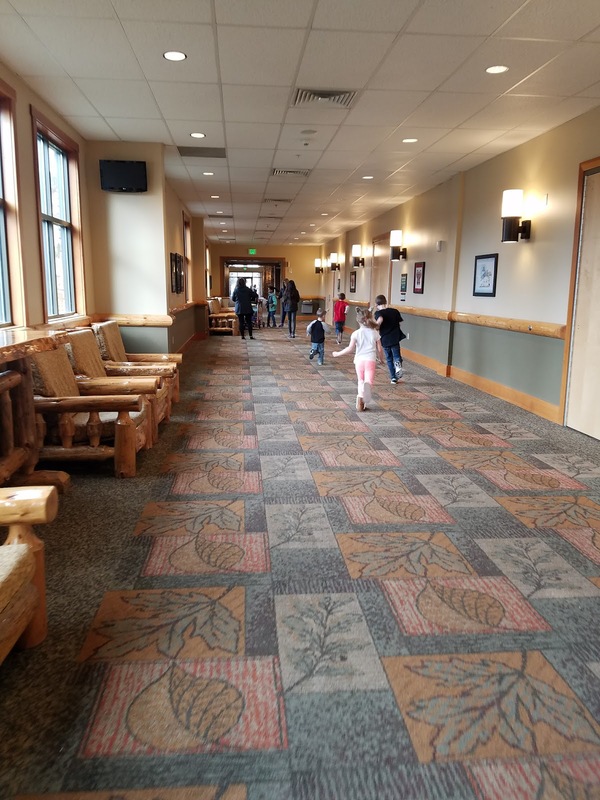 I didn't want to constantly hear kids coming and going and being all loud and excited. Well they certainly didn't put us next to the elevator at all. 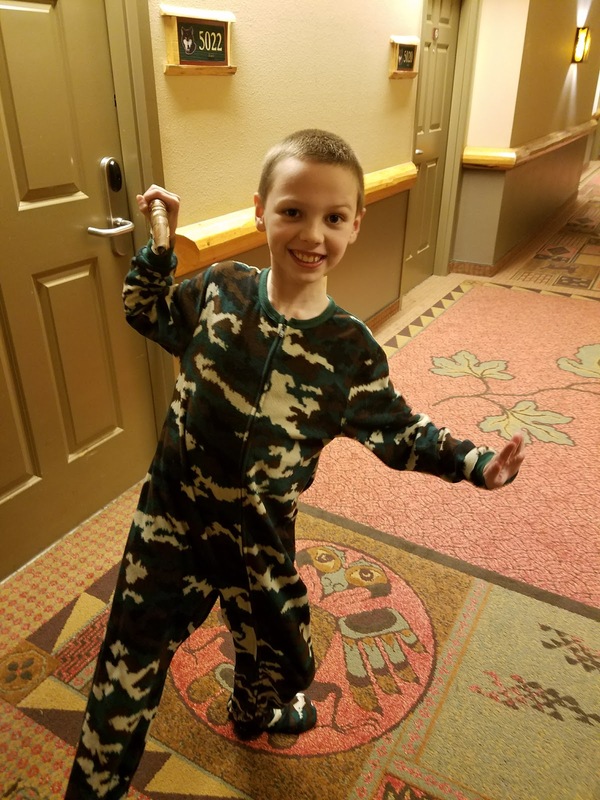 It was a trek to our room! After doing a bunch of research I decided that we were not going to head to the water park first. That's what everyone does. Then later when everyone is exhausted they head out to do the quest game. 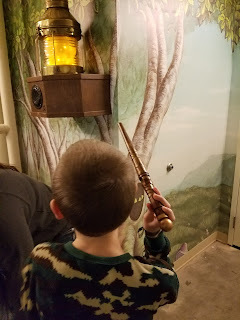 I figured we would take advantage and do the quest when it wasn't so busy. When Melinda was telling me about this deal she told me that we could borrow their families wand to use on the quest. That saved us about $20. We did have to buy a game for $14.99 and 2 AA batteries for $5!!! I was going to remember to pack them, but I forgot! The game was super cool, but very confusing at first. For example this is The Forgotten Hall...one of the clues said that we could find this thing we were searching for at the end of The Forgotten Hall. Well we went to the end, but it's really only talking about this little section right here. Like I said...confusing! 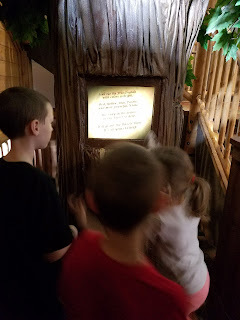 Every time we needed to start another quest we had to come back to one of the trees and select the quest we were going to go on and then we were off. 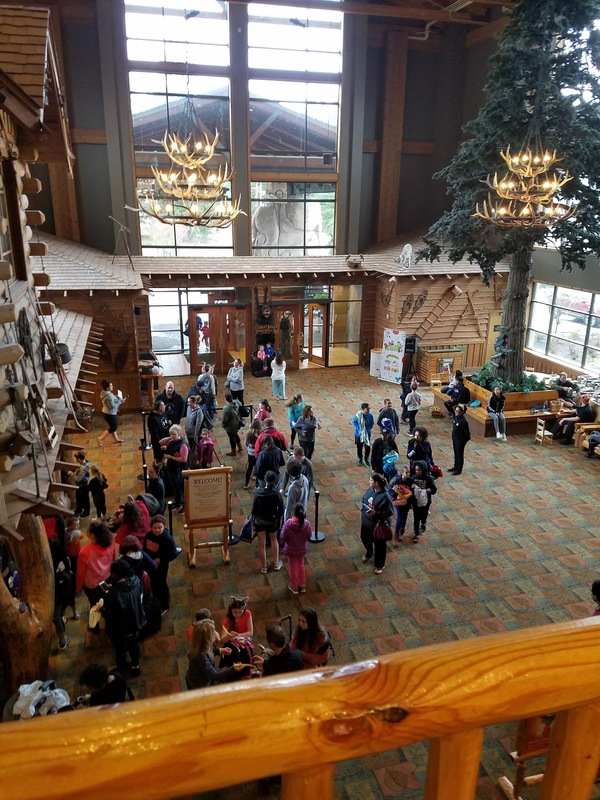 I didn't really take that many pictures of the actual Lodge. I meant to get ones of the outside because the entrance is gorgeous, but it was POURING down rain so that never happened. After about an hour or so of doing the quest the kids couldn't take it anymore so we came back to the room to get ready for the water park. I have zero pictures of the water park because I didn't want to risk losing my phone or ruining it by dropping it in the water. So you'll just have to imagine a giant indoor water park with a wave pool, an activity pool, a kiddie area with 2 water slides and a giant bucket that dumps water every 2.5 minutes, 4 huge water slides and a ton of people. It was amazing and loud!! It was hot when you first walked in, but then once you got wet it wasn't bad at all. 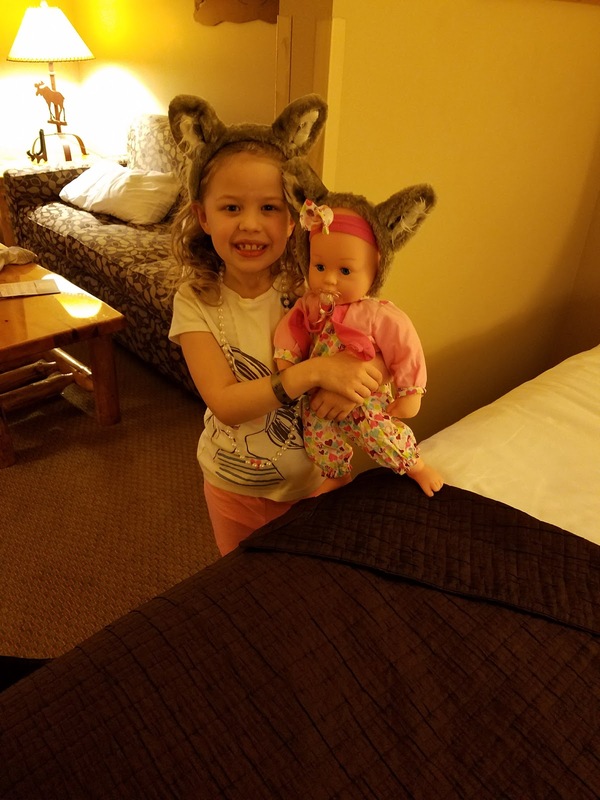 In all I think we were at the water park for 3 hours before we were done and ready to go back to the room. I had brought a bunch of our food with us because again we like to stay on a budget and I had only brought $130 spending money. 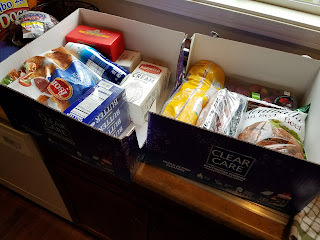 We had a bunch of food left over from Ella's party so that helped with making it easier for packing food. After dinner we took the kids down to the gift shop. We told them we would give each of them $5 to spend on whatever they wanted. They all had money they had brought with them. I think Ella had the most at $23. 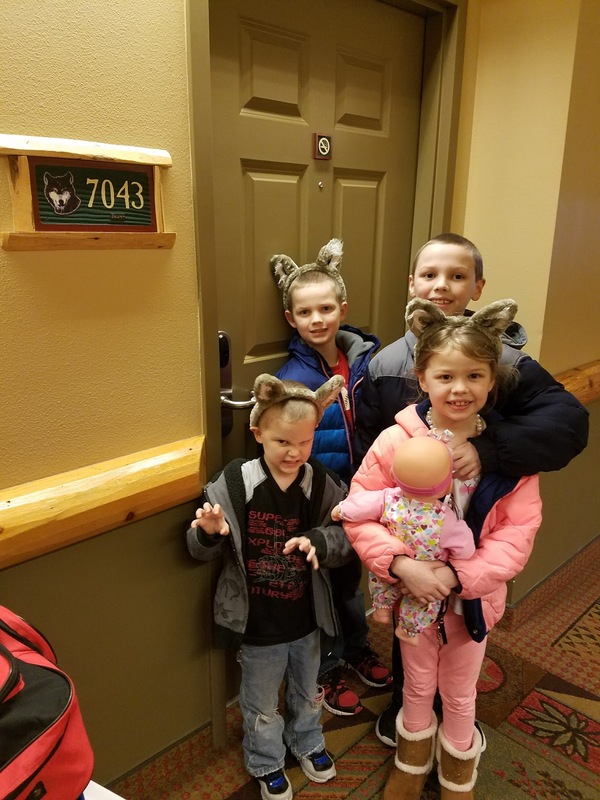 Ella ended up getting this reusable water coloring book and a rainbow colored wolf, Owen got a giant pixie stick and pop rocks, Zeke got a pixie stick as well and Jack got a cute gray wolf. Later on Michael did walk over to the Burger Claim and brought back french fries and milkshakes for a snack. The 3 youngers ones and Michael were all pretty tired so they were just chilling out watching America's Funniest Videos, but I really want to go do more of the quest. Owen was up for going with me so we sneaked out just the two of us. One of the things I read about the Lodge is that it's not like a typical hotel where you wouldn't or shouldn't walk around in your jammies. This place is full of kids running around in swim attire and they have a story time at night so the kids are in their jammies. It's just totally casual. 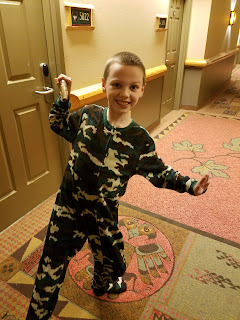 Owen has been in love with his camo footie jammies so this was perfect time for him to show them off. This is probably my favorite memory from the trip....just me and my boy having one on one time together. Since story time was over and the water park was closed there was a ton of people doing the quest. I know it doesn't look like it in these pictures, but we had to wait a few times for people to finish in order to get to the area we needed. I think we were out there for an hour and we were pooped by the time we were finished. We headed back to the room and finished watching Tangled with the other kids and then it was lights out at 10pm. We all slept in until 7:30 or 8...PTL! I had packed breakfast for us. I had cooked a whole pound of bacon on Saturday night after Ella's party so we'd have some protein to keep us going. I was fine with eating cold bacon and so was everyone else except Owen. He wanted his heated in the microwave. I don't know if something was wrong with the microwave or if heating bacon up in one is just a no no, but it was only in there a few seconds and half of it was burnt and it smelled up the whole room with this awful smell that was worse that burnt popcorn! Thankfully the window open and it aired out really quickly. I was so afraid we were going to set off the fire alarm! 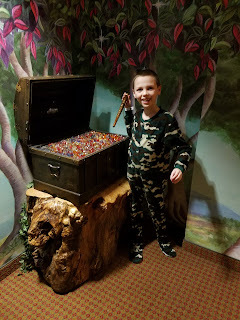 We had read that you should check out of your room before you go to the water park which makes total sense. Who wants to get all dried off to go check out and then get back in your swimsuit again. 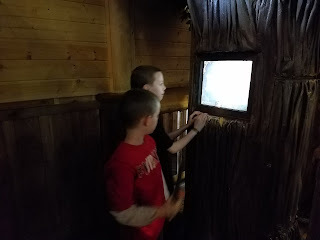 I figured it would just be easier for me to get everyone packed and ready so Michael took the older 3 kids to go do more of the quest while Zeke helped me pack up. Once they got back we all changed into our swim clothes and then Michael took all the suitcases down to the van. The kids and I went to the water park and amazingly we found an empty table. This made all the difference to me when it came to enjoying the water park. The day before we couldn't even find an open chair let alone a table. It was so nice to have a home base to come back to. We also got more relaxed with Owen and Jack. I mean they are 10 and almost 9! So we let them go off on their own as long as they wore life jackets. That made the day much easier for Michael and I. Zeke of course only wanted to hang out in the kiddie area, but he did do one of the slides twice. I did all 4 of the slides with the boys during our stay. After a while Zeke was cold and hungry so we sat down and got some chicken strips and then Michael came back with the older kids and they got more chicken strips. Around this time is when Ella didn't feel so good. She said her tummy was hurting, but she didn't feel like she was going to puke. I really think she didn't drink enough. We ended up staying a bit longer and then getting all dried off and changed. We stopped and got pizza at the pizza place that's right outside the water park entrance and then we were on our way. I was hoping to stay until 5:30, but we ended up leaving at 2:30. By the time we got home Ella was almost asleep so we put her to bed and she slept for almost 2 hours. 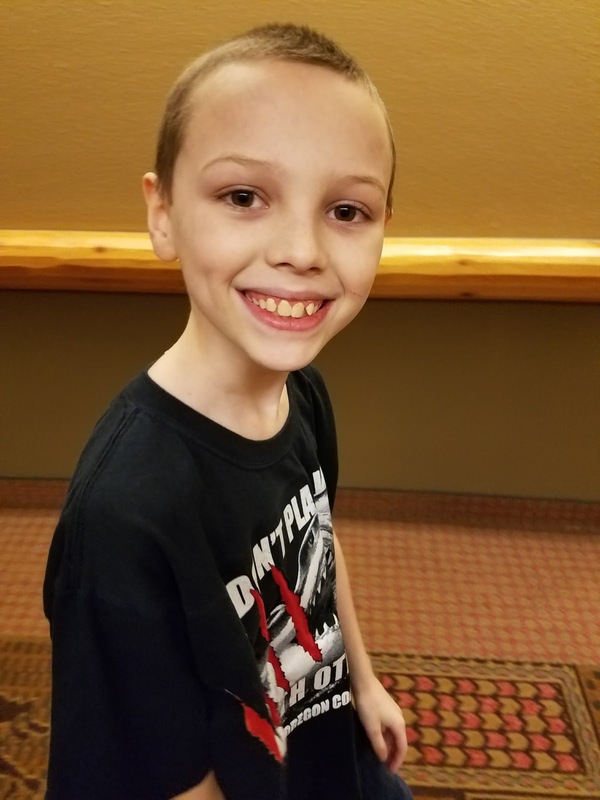 Even after eating a bunch of food that day at the water park we still had enough spending money to get dinner so Michael went out and got that for us. Yay for not having to cook any meals for over 24 hours!!! In all it was a whirlwind trip that was just over 24 hours and it was great!!! Michael said that we will be making this a yearly tradition if we can get that same deal with the co-op. It was fun to see how things worked and learn what we liked and what we didn't like and now know that we would do somethings differently. The number one thing we need to do next time is really make sure Ella is drinking a lot! 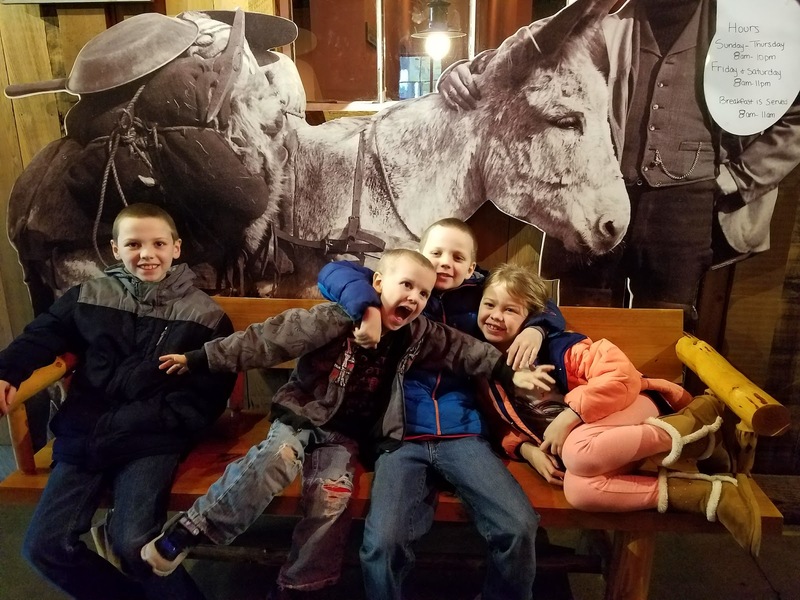 Thanks Melinda for introducing us to a great family fun vacation!